A developer of humanlike robotic manipulator arms has received a $2.5 million contract from the Office of Naval Research (ONR) to continue development and commercialization of its Dexterous Maritime Manipulation System (DM2S). RE2 Robotics’ DM2S technology will provide Navy Explosive Ordnance Disposal (EOD) personnel with the ability to remotely and effectively address Waterborne Improvised Explosive Devices (WBIEDs). WBIEDs and mines pose a significant threat to vessels, bridges and ports, and when placed in congested areas, such as bridge pilings, they can be particularly difficult to access and defeat. 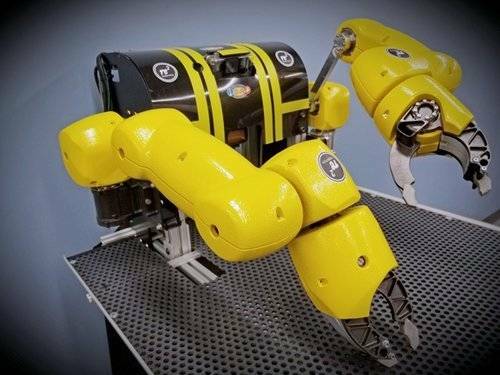 Recognizing the inherent dangers present in the detection and inspection of WBIEDs, there is a critical need for robotic systems that can perform EOD tasks with the accuracy and speed of a naval diver. "As with the majority of our robotic technologies, the goal of the DM2S is to keep humans out of harm’s way while performing dangerous tasks. DM2S provides Navy EOD personnel with the ability to address threats like WBIEDs from a remote location, such as from a ship or on land,” stated Jorgen Pedersen, president and CEO of RE2 Robotics. RE2’s dual-arm DM2S is capable of easily integrating with underwater vehicles already in use by the Navy, eliminating the need for the military to purchase all new robotic systems for underwater operations.